An unmarried woman living in a house of men breeds hearsay and lore. If only the villagers knew the truth. It’s not Jem Stonehouse’s marital status that brings unwanted strangers to town. Rather, it’s that she is the only female werewolf in existence — a prize to any pack. Sean Holloway, the love of Jem’s life, has gone to great lengths to protect her. As a new attack becomes imminent, Sean realizes he must take greater measures with Jem’s safety or risk losing her forever. His first task must be to marry her, but a force greater than the largest werewolf stands in his way. Eternal is the fabulous prequel story in J.A. Belfield's Holloway Pack Series. It expounds on certain parts of Jem Stonehouse and Sean Holloway's history alluded to in the first novel, Darkness & Light. Jem, Sean, and Jessica are the only familiar names in Eternal. What gives? Set in a different time period, Eternal portrays the past in which Jem and Sean are bound to each other for eternity. Opening with a steamy scene, Eternal packs a lot of romance in novella length story. From protection to marriage, readers see Jem and Sean's relationship from the very beginning. I love the consistency found between Eternal and Darkness & Light. Even though the versions of Jem and Sean, in Eternal, have different positions in life than the Jem and Sean in Darkness & Light, they have the same attitudes and values. I do consider them the same people, but each life they live is a little different, like the family dynamic in the prequel. 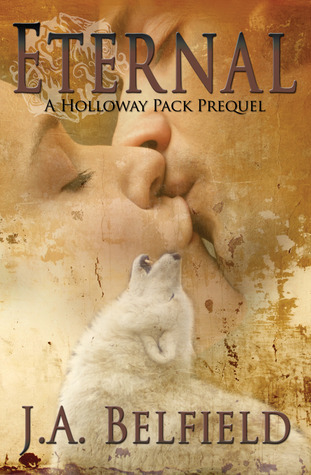 Eternal is the next stop until book two of the Holloway Pack Series releases. Full of action and romance, it's enough to hold readers over until Blue Moon hits shelves!